Three major fires continue to scorch the ground in both Northern and Southern California as more than 8,000 firefighters battle the flames across a total area of more than 325 square miles, according to the Associated Press. More than 40 people have been confirmed dead statewide so far, and the search for bodies continues in the town of Paradise, which was almost completely destroyed by the so-called Camp Fire. AP reported that the sheriff there has tallied that more than 200 people are unaccounted for. More than 6,700 homes and other buildings have been destroyed by the Camp Fire alone, according to a Cal Fire update on Monday. As it stands right now, some evacuation orders in Southern California — where the Woolsey Fire is 20 percent contained — have been lifted, though mandatory evacuations remain in effect for affluent enclaves Malibu and Calabasas. Recovery is a “a monumental task. 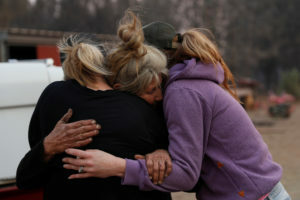 It’s unprecedented,” Sheriff Kory Honea, who is also the coroner of Butte County, told the PBS NewsHour’s Judy Woodruff. With so many people across such a large area, there are “countless partners” working on recovery, McNamara said, from shelters to cell phone companies, shoe companies to local community organizations. As recovery continues, here’s a look at several different ways you can help. The California Fire Foundation has a Supplying Aid to Victims of Emergency (SAVE) program, which provides immediate short-term financial assistance to both victims and firefighters in the form of $100 SAVE gift cards. You can donate to the fund here. Los Angeles Fire Department Foundation helps provide first responders with equipment and supplies. Over the weekend, the foundation requested donations to help provide firefighters with hydration backpacks. You can donate online here. United Way of Greater Los Angeles has partnered with United Way of Ventura County to create a Disaster Relief Fund in support of those affected, specifically targeting low-income communities and working individuals. You can make a donation here or by texting “UWVC” to 41444. Direct Relief, a humanitarian aid organization, has been providing equipment and medicine to firefighters and health care agencies. You can donate online here. The Entertainment Industry Foundation, originally started by stars in Hollywood, has set-up a Fire Relief Fund that goes towards helping firefighters and first responders. You can donate online here. The American Red Cross has been helping provide support and shelter to evacuees. You can help by giving online here, calling 1-800-RED CROSS or by texting the word RED CROSS to 90999 to make a $10 donation. Google and the Center for Disaster Philanthropy have partnered to help fire relief efforts. You can donate on Google here and the funds will go directly to the CDP. GoFundMe has set-up a page for relief effort donations, and includes individual campaigns of those who have lost their homes and belongings. The Airbnb Evacuee Program is open for hosts to volunteer free housing to victims and relief workers. You can sign-up on their website here. The Salvation Army is working across both Northern and Southern California to help provide meals to shelters. To find specific information regarding each area affected, or to make a donation, you can visit their site here. Humane Society of Ventura County is a private nonprofit unaffiliated with the Humane Society of the United States, accepting donations to help care for evacuated animals from the areas of the Hill and Woolsey fires. You can add to their fund online or by calling (805)-646-6505. 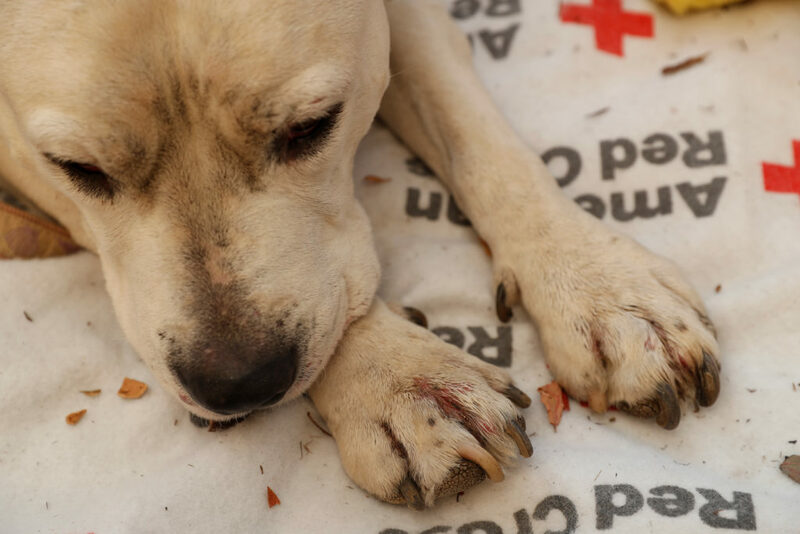 The Los Angeles County Animal Care Foundation helps provide shelter to pets whose owners have been evacuated, as well as provide training on the safe evacuation of horses. You can give to their cause here. The Humane Society of the United States provides sheltering support for evacuated, rescued and displaced animals. They also provide grants to several other local organizations assisting pets affected by the fires. You can support their efforts online here. Caring Choices, a California nonprofit, is accepting volunteer applications. You can find their application here. As their website states: Above all, please do not self-deploy.